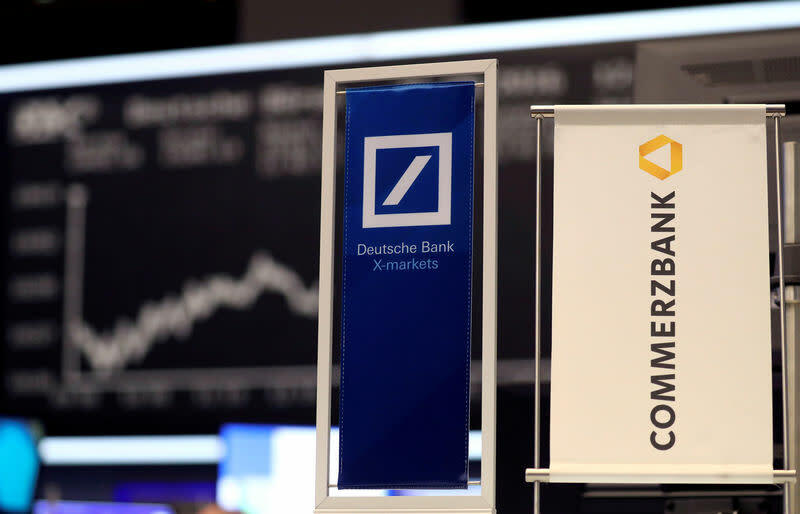 FRANKFURT (Reuters) - Germany's Verdi labor union on Tuesday objected strongly to a possible merger between Deutsche Bank and Commerzbank, arguing that the merged group would be a more attractive target for a hostile foreign takeover. The union also said in a statement to Reuters that Deutsche's problem investment bank, would not be helped by a tie-up with Commerzbank. A merger would put at least 10,000 jobs at risk, it added. "We reject a merger," said Jan Duscheck, head of Verdi's banking division. It wouldn't create a truly big bank in the European market, and the new entity would be "considerably more attractive for a hostile takeover, for example, by France," he said. "The merger would not result in a 'national champion'," he added. The union's reaction follows news over the weekend that Deutsche Bank's chief executive Christian Sewing had agreed to hold tentative talks with rival Commerzbank. Berlin, which has been worried about Deutsche's health, has pushed for a merger as Deutsche has struggled to generate sustainable profits since the 2008 financial crisis. Verdi is among Germany's largest unions, representing 2 million workers across a range of industries. The union is calling for a 6 percent wage increase for 200,000 workers that it represents in state and publicly-listed banks. The union has two seats on Deutsche's supervisory board and two seats on Commerzbank's board. Duscheck sits on Deutsche's board. Fricke, speaking to Reuters, said the decision should be left "to the companies as it should be in a social market economy."